My goal for this month is to get the blocks all sewn together into the center of the quilt top. So far I have the blocks sewn into rows and the bottom two rows sewn together. As shown on the wall here, this part of the top will finish at 70" x 70". This project is kind of special to me, and I'm taking care in the construction of it. I'm pleased with these points so far; three more rows of them to go. I need to get the rest of the rows sewn together by Saturday for this month's AFS meet-up with my friends. Next month the goal will be to add the first border. That is a stunning quilt. It looks like you took great care with the placement of your blades on the fabric. That one with the swirly design going down the middle is cool. I hope that the rows sew together easily and all your points match just how you would like them too. I know it's been a labor of love, but it is definitely paying off in how it is turning out! It’s a beauty, Jan. Your hard work and diligence is paying off. 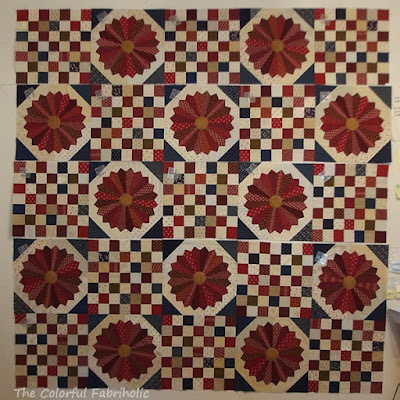 Perfect points and a lovely quilt top! Good job! 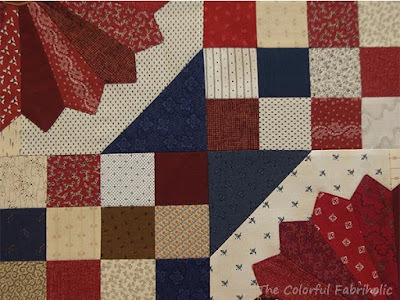 Step by step, your lovely red piece is coming together! Will it be finished for the holidays?